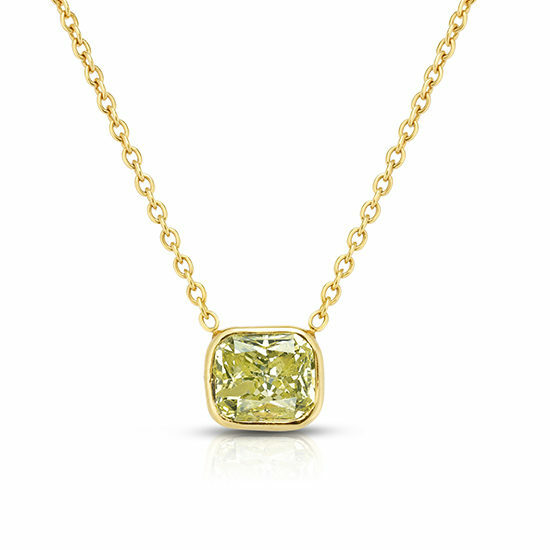 Beautiful Diamond Pendant with a GIA Certified 2.11 carat Natural Fancy Greenish Yellow Radiant Cut Diamond. This rare colored stone is bezel set East West in 18k yellow gold setting on an 18K yellow gold 17″ chain. Designed for Marisa Perry Atelier by Douglas Elliott. Layer this necklace or let it stand alone. Made in NYC. Email [email protected] or call 212-566-8977 for custom orders. Ships in 2 weeks with credit card payment and ships within 3 days of receipt of wire transfer.